Take a tip from Vermont librarians last year, and try an easy exhibit to celebrate Banned Books Week, September 25−October 2, 2010. For more information, see the official ALA link. Here’s a short list of some ideas. 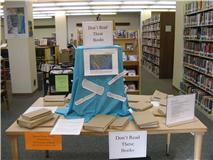 The St Johnsbury Academy put together a display of banned/challenged books blocked with Police Do Not Cross tape. Several students and faculty checked out books from the display. At the Waterbury Public Library, the display of books included red buttons with the message “I read banned books.” Any patron checking out a banned book was given a button to wear. Marilee Attley at Brattleboro Union High School created a Caution banner with “Ideas inside” “May be eye-opening” to highlight Banned Books and about 10 titles with the reasons they were challenged. The Rockingham Free Public Library created a circus poster frame for a live action display showing local people reading banned books. This entry was posted in Book Lists and Collection Promotion and tagged Banned Book Week, Banned Books Week, Brattleboro Union High School, Rockingham Free Public Library, Springfield Town Library, St Johnsbury Academy, Waterbury Public Library. Bookmark the permalink.